Home » Featured Oceanfront Property: 26706 Latigo Shore Dr. Welcome to Latigo Shore, a private, peaceful stretch located directly on the beach. 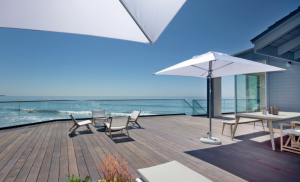 This Malibu beach house boasts a huge wooden deck, perfect for any type of outdoor events. The unique, seamless design of the interior truly brings the smells, sounds, and views of the beautiful Pacific Ocean into all aspects of life here. The direct beach access, along with the countless spots around the home to sit back and relax makes this home a true masterpiece to own. Uniquely positioned beach bungalow with incredible ocean, city light and sunrise views. This newly redesigned beach house sits on approx 90 feet of frontage making the property a true Malibu gem and a perfect oceanfront weekend get-away. This surf break is one of the best-kept secret beachfront neighborhoods in Malibu. Don’t miss the opportunity to own your spot in paradise. For more information on this lovely property click here, or if you would like to learn more about the agent that this property is listed with click here!